The new cabbage soup diet is quite similar to the old diet, but it is a bit easier to follow and allows dieters to eat more balanced meals. There's more to it than just soup. It's low fat and relatively easy to follow for a short period of time. Imagine losing anywhere from 20 to 40 pounds in one month! Sound too good to be true? That's because it probably is. Can you lose weight on the cabbage soup diet? You can; weight loss results can be quite dramatic. However, these results typically won't last. Much of the weight loss is liquid, and obviously, a body cannot sustain this diet over an extended period of time. Doing so could be detrimental to a dieter's health. 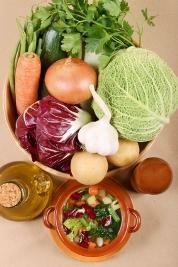 If you want to jump start a weight loss program, however, then the cabbage soup diet might be what you are looking for. After you've lost the initial weight over a reasonable, short period, you should change to a more realistic style of eating and concentrate on eating healthy foods with a balanced approach. The old Cabbage Soup Diet had its pros and cons and has been around for several years, but now a new version of the cabbage soup diet has entered the dieting scene. The premise behind this diet is similar to the older version. You can drop those pesky pounds quickly, but again, if you don't switch to a healthier diet on an ongoing basis, you may end up packing the weight right back on once you go back to normal foods. Other side effects include an increase of gas and other stomach discomfort. One other downside to this diet is that you can easily become bored, so consider the different recipes included below for some added spice. Unlike some of the original recipes, this has some brown rice, so it may be more filling and satisfying for some people. The following is the general schedule for the new cabbage soup diet. Day one: Eat as much soup as you want as well as unlimited fruits, along with one cup plain low-fat yogurt or one 8 oz. glass of skim milk. Day two: Continue with unlimited soup. In addition, eat unlimited vegetables, along with one cup plain low-fat yogurt or one 8 oz. glass of skim milk. Add one baked potato for supper. Day three: Unlimited soup, fruit, and vegetables, along with one cup plain low-fat yogurt or one 8 oz. glass of skim milk. Day four: Continue with unlimited soup, but on this day drink eight 8 oz. glasses of skim milk and three to six bananas. Day five: Continue with unlimited soup, and add unlimited broiled or grilled fish and six fresh tomatoes. In addition, eat one cup plain low-fat yogurt or one 8 oz. glass of skim milk. Day six: Unlimited soup with unlimited broiled or grilled chicken and unlimited vegetables, along with one cup plain low-fat yogurt or one 8 oz. glass of skim milk. Day seven: On this last day, repeat day three's menu. Healthy food choices: If you have eaten a diet high in sugar and refined foods, making the switch to eating lots of vegetables, fruits, brown rice, lean meat and dairy is a wise one. Inexpensive: With the staple of the diet being cabbage soup, and the other allowed foods consisting of brown rice, bananas, fruit and milk, this is probably one of the cheapest diets you can go on. Easy meal planning: You will not have to prepare multiple, complicated dishes for daily meals. Once you have made a big pot of cabbage soup, the work is done for the next few days. Easy to follow: The diet is clear as to what to eat each day. The only decisions you have to make are how many bananas to eat on banana day, or what type of fruit to eat on day one. No calorie counting: By nature this is a low-calorie, low fat diet, and no calorie counting is necessary. Weight loss is fast: An easy way to lose weight fast for that upcoming class reunion or wedding. Don't get hungry: You are allowed to eat as much soup as you want, so hunger is not an issue. Weight loss does not equal fat loss: If you do the math, it is simply not possible to lose 10 pounds of fat in one week. In order to do that, you would have to have a calorie deficit of 35,000 in that one week. If you were maintaining your weight on 5000 calories a day, you would have to eat absolutely nothing to lose 10 pounds of fat or muscle. Unless you are a professional athlete, you are not maintaining your weight on 5000 calories a day. Most people need between 2000 and 2500 calories per day in order to maintain. Even if a person consuming 2500 calories a day ate nothing for one week, he or she would only have a calorie deficit of 17,500; the equivalent of five pounds. Therefore, much of the weight lost on The Cabbage Soup Diet must be water weight. Also, your body will not be loaded down with the usual foods that take a long time to digest, as the cabbage soup keeps your digestive system moving. Since your intestines are not laden with heavy meals, and you have lost water weight, weight loss will show up, but all of it will not be the weight loss you are looking for. It is simply not mathematically possible. Side effects: Many individuals report feelings of weakness or other ill health, such as headaches, while on The Cabbage Soup Diet. The reason for this is that the caloric intake is very low, and the full range of needed nutrients is not present with this eating plan. Not family friendly: If you are the person who prepares meals in your household, you will have to prepare separate meals for the rest of the family, lest you suddenly become very unpopular. It can be very challenging to be on a restrictive diet while preparing lasagna and garlic bread for others. Boring: While it's nice to think you won't get hungry because you can eat as much of the soup as you want, eating the same thing every day gets boring. Low energy: Due to the low caloric nature of this diet, many people experience low energy. Not healthy for everyone: While this diet is comprised of healthy foods, it is not right for people with health conditions like diabetes. In order to add variety or to cater to your food preferences, you may want to try one of the popular alternate recipes for the soup on this diet. All of these variations are similar in how effective they will be for your weight loss, so just choose the ones you enjoy eating the most. Clean and dice all ingredients into bite-sized pieces. Put in a saucepan and cover with water. Simmer until vegetables are the consistency that you prefer. For most people, this will be about an hour of simmering. If you like, add hot sauce to taste. Spray a large pot with cooking spray. Sauté all vegetables except cabbage and tomatoes until tender. Add V8 juice, broth or water. Add bouillon cubes and/or soup mix. Cook until soup reaches desired tenderness. While these variations do not include the rice found in the new recipe, it can be added to them as well. Obviously there is only so much you can do with the soup recipe, but with this new plan for the cabbage soup diet, you can add more variety and break up the monotony. For example, break out the grill and whip up some delicious skewered vegetables. Add a variety of seasonings and flavorings, like Tabasco sauce. Chop up onions and garlic for even more flavor, and look for different veggies and fruits that you don't normally purchase. Finally, if you really want to lose weight on this diet, then stick to it for the entire seven days. Be sure you drink at least four glasses of water each day, and take a multi-vitamin as well. Remember--if you have any health issues, contact your doctor before starting this or any diet.